Haryana Governor, Mr. Satyadeo Narain Arya in a meeting with former Vice Chancellor, Punjab University and Babasaheb Bhimrao Ambedkar University, Padam Shri Dr. R. C. Sobti at Haryana Raj Bhawan, Chandigarh on September 24, 2018. Chandigarh, September 24- Haryana Governor, Mr Satyadeo Narain Arya, today urged the universities and educational institutions to lay their focus on research and study works to provide quality education to the students. The Governor today met representatives and officers of various educational institutions, here. He said that at present, there are 42 government and private universities in the state, which are equipped with good infrastructural facilities. In the tenure of present state government, 44 colleges have been opened, of which, 29 are women colleges. The State Government has laid special emphasis on girl education. Tuition fee has been waived off for girl’s students in government colleges, in the state. Also, several beneficial schemes are being run for providing education to the students belonging to poor families. He urged institutions of private sector also to emphasise on providing education to the poor students. The former Vice-Chancellor of Panjab University, Chandigarh and Dr. B. R. Ambedkar University, Dr. R.C. Sobti (Padma Shri) also met the Governor. Dr Sobti presented the Governor with books on Dr. Bhimrao Ambedkar, Science, literature and other topics. 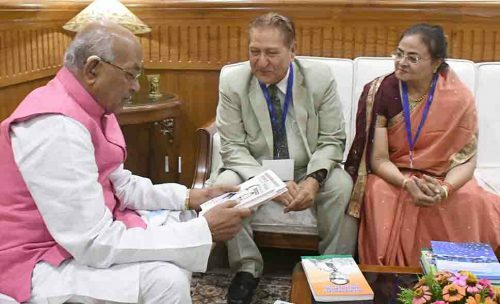 The Registrar, Kurukshetra University, Kurukshetra, Mrs Nita Khanna also met the governor and spoke on various topics. श्राद्ध एक रहस्य जानिए हमें क्यों श्राद्ध मानना चाहिए ?